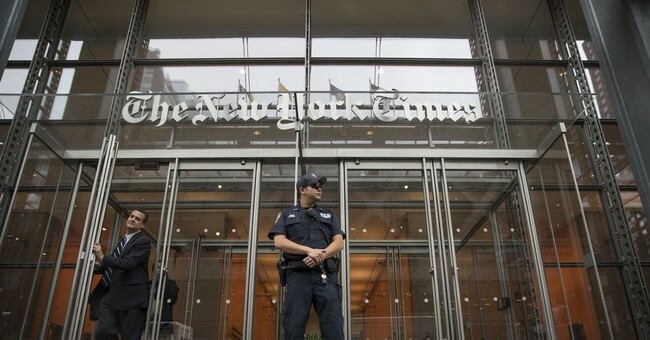 The NYT is the Fake News leader of POLITICAL WARFARE against the American people and President Trump . I need to say that this type of Political Warfare is found locally in Florida Today/US Today. President Trump should probably call off the hunt for the “senior official in the…administration” who the New York Times is claiming wrote a damning op-ed for the newspaper.Apparently the “senior official” claims to be part of a group of White House staff trying to thwart the president’s agenda from within. He also claims they seriously considered trying to depose the president using the 25th amendment of the Constitution.Serious stuff. But President Trump should relax and remember it is the New York Times after all. The paper has a scandalous history of lying about the seniority of officials it quotes anonymously – especially when that source parrots their agenda. In a lengthy anti-fracking article they claimed that senior industry experts and insiders believed the industry to be little more than a “Ponzi scheme” … “set up for failure”. Well unfortunately for the New York Times, the emails were from the Energy Information Agency – a government organization – so this meant Senate investigators were able to find the original emails and work out the identity of all these different senior experts. It turns out the federal analyst, the energy analyst and the officer turned out to be the same person who was actually an intern when he wrote the first email and in an entry level position when he wrote the other comments. Yes, that’s right, the “Paper of Record” misrepresented an intern/junior employee as a senior official to push an agenda. Well it sounded fine to the New York Times editorial board. They stood by their mislabelling of the intern/low level employees as a senior official. They later decided they didn’t want their stories to be second guessed in their own newspaper so they ended the role of public editor in the newspaper. And the reporter who misrepresented the intern, well, he was promoted. Ian Urbina is now a New York Times “investigative reporter based in Washington.” Maybe part of that investigation involved finding someone to write anti-Trump anonymous op/eds posing as a “senior official in the Trump administration.” President Trump is probably wondering who the anonymous official is. Perhaps given the New York Times’s history of dissembling in this regard he should take his eyes off the cabinet table and wander down to whatever part of the White House holds the interns. A good friend of mine sent this article published in TownHall to me. The author is Evan Sayet, and the article is entitled He Fights. This is a spot on assessment of why President Trump was elected,and why each day, more Americans stand up for him. This goes to point whether you voted for him or not. Another hard hitting and fact laden piece in the Orlando Slantinal..
Mr.Scott Maxwell evidently did not take the time to speak with any of the parents that submitted 33 sworn affidavits, nor testified before the Florida Senate Education Committee, as to why the Materials Review process, from our own personal experience, is broken. Go figure! After all, as Mr Maxwell states, we don’t want to worry about what our kids are exposed to, right? What exactly is Mr Maxwell afraid of ? Is it presenting all sides of an issue equally and fairly? Is it having parents truly involved in the decision making? We want a system that is transparent and parent centered when considering educational materials. That is the parent’s job. If Mr Maxwell had spoken with me or read my affidavit, he would have learned that we want a system set up so that parents can decide which materials are appropriate or not and guide their child’s education. It is about having a system, that is easily accessible to the parents, offering full disclosure of school material content, with any previous/present objections and/or praises. That way, the parent can make informed decisions.Today, that does not exist. Today, if a parent wishes to challenge material, (opening their child to ostracization), the 2 school committees are hand-picked by the principle. All members were Brevard Public School employees or have a relationship with the principle. The same goes for the School Board committee. So the very same system that presently blocks any active and meaningful parent’s participation, is the same system to decide appropriateness of material. Mr. Maxwell continues , “But now, in the age of fragile snowflakes — where people want to be shielded from any information that might test their assumptions…” . Really? If the Theory of Evolution, which is not a fact,(therefore..a Theory) is taught as a fact, then so should Creation. If Science Deniers teach Man-made Global Warming as a scientific fact, which is not, then the converse, using the scientific method to disprove this false assertion should be taught and published. It never is, instead, we are called names because we contest the content; whether age inappropriate or against our values as parents, or just not the truth. So Mr Maxwell, who exactly is being “shielded from any information that might test their assumptions”? Seems like your liberal ideals promote censorship, rather than encouraging open learning and discourse. If all sides of a topic are not being taught (which they are not), then that is a disservice to all children, and is Censorship. Critical thinking is not force feeding one line of thinking into a child’s mind full of mush. Critical thinking is taking ALL facts, assumptions and information, debating openly and fairly, weighting all details and then making an informed decision. “Snowflakes”? Are they the ones too afraid to have conflicting ideas published and debated in the light of day? Are Snowflakes doing the “Chicken Little” impersonation, while frantically running around yelling book banners, pro-censorship, book banners, pro-censorship? Speaking of banning books, I have not seen the best selling text in history in public schools and being openly studied and debated; that would be the Bible. Why not “fight” for that one? Mr Maxwell, the statue you referenced with “1000s of words” does not contain the language to enforce what the statute says. That is why we have the present bill. I don’t understand how you missed that. State Rep.Mercado says she has;..” been able to handle any concerns regarding my children’s educational needs,” Mercado said, “with their teachers, school administration and, if necessary, the school board.” Do you think, just maybe, that being a STATE REP. AND BEING CONNECTED might have something to do with that? Sorry, the vast majority of parents don’t have that luxury. Additionally, Rep. Smith says,“The existing process to object to school instructional materials isn’t broken.” Spoken like a man that has NOT gone through the process. Once more; this is not about being book banners or pro-censorship. It is about empowering parents to have a meaningful and impactful influence in what their children are being taught and exposed to in school. Presently, here in Brevard County, that process is null and void of any true parent involvement what so ever. To the contrary, parents are blocked. The philosophy of the classroom for one generation will be the philosophy of the government in the next. MATERIALS CHALLENGE AFFIDAVIT PRESENTED TO THE FLORIDA SENATE EDUCATION COMMITTEE.. This is the followup from the April 20,2017 Orlando Sentinel article. Here is my affidavit that will explain in detail what was written sparingly about. The affidavit was given to the Florida Senate. I later testified before them. It will explain what has compelled me to speak out, write and protest the issue of parents not being allowed to have any meaningful and impactful role in their child’s education.